Is your skin looking dry and lusterless these days? Perhaps it is due to your genetics, the heat, the wind, excessive sweating, or wearing clothes that are too tight on you.. Whatever the reason may be, you can easily get rid of old, dead skin and expose new, fresh skin underneath to give your body a healthy glow. How can we achieve this magical effect? It’s simple – we use a body polish. What Is a Body Polish? A body polish is similar to a body scrub in that both of them help in exfoliating your skin. But the key difference is that a body scrub also cleanses your skin. A body polish, however, is designed to moisturize your skin. So if you are looking to exfoliate your skin and then follow it up with an intense moisture replenishment, then a body polish is perfect for you. A body polish usually has an exfoliating agent, such as walnut or apricot kernels, sugar, or sea salt blended in with moisturizers and essential oils. It is a popular spa offering that is typically followed by a body wrap to give you renewed skin within an hour of treatment. But you don’t have to go to the spa every time you need to revitalize your skin. You can simply achieve the same results at home by using a good body polish. With so many body polishes available today, we are listing the top 7 body polishes in India to make your hunt for the best one easier. Read about them below. 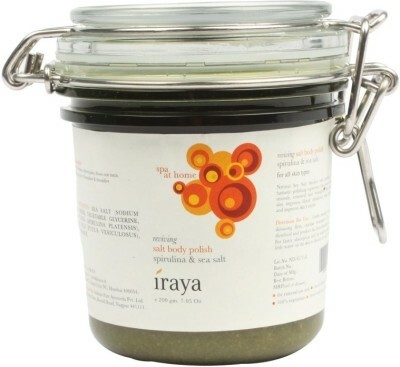 The Iraya Reviving Sea Salt Body Polish is a marine-inspired beauty product that harnesses the power of the ocean to improve the look of dull and lifeless skin. It contains spirulina and sea salt – two very effective marine nutrients. Spirulina is a type of algae that is loaded with vitamins and minerals that increase surface circulation and calm irritated and inflamed skin in order to renew your skin’s finish. It also contains sea salt, which is a wonderful exfoliating agent that eliminates rough patches of skin and improves your body’s tone and texture. 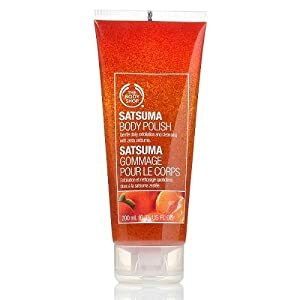 The Satsuma Body Polish by The Body Shop is a gentle exfoliating foaming gel that foams and sloughs away dead skin cells to leave the underlying skin soft and refined. Its energizing scent gives you a spa-like experience at home. The Oilcraft Naturals Fig, Walnut & Litchi Body Polish has been formulated with an ancient Ayurvedic recipe to buff, tone, and polish your skin. It contains honey and glycerin, which heal blemished skin, and olive oil, which hydrates it. It also contains aloe vera gel, which eliminates the toxins in the body. The litchi, fig, and walnut components gently exfoliate the skin to leave it smooth and supple. The Organic Surge Skin Perfecting Polish is made with natural granules from apricot stones and walnut shells that help exfoliate your skin. The granules are blended in a rich medium comprised of rosemary oil, lemon, sweet orange, and almond oil. This polish helps reduce skin irritation and keeps it youthful and bright. The Lotus Herbals Revitalizing Skin Polisher is rich in vitamins A, C and E, which help fight against free radicals in your skin. This polisher is also infused with granules and a subtle fragrance derived from grapes and kiwi fruit. It helps rejuvenate and tone your skin, leaving it bright and fresh. The Tvam Scrub and Body Polisher is infused walnut shell granules that gently sweep away dead skin cells. It also contains almond oil, which keeps your skin radiant and glowing, as well as various Ayurvedic extracts, which enhance your skin’s tone and smoothness. It also features kokum butter, which provides a deep moisturizing effect and fights against inflammation. The Forest Essentials Cane Sugar and Tamarind Body Polisher gently removes dead skin cells and revitalizes your skin to give it a healthy and radiant glow. It is made with cold-pressed organic sunflower oil, sea salt, and almond oil. It also contains real cane sugar crystals soaked in a blend of citrus oils with pure tamarind pulp. These ingredients act together to gently buff away dead skin cells and moisturize the underlying renewed skin. So, use one of these body polishes and enjoy fresh, rejuvenated skin free of impurities. Good luck and happy polishing!